Indian arts and crafts, the top of the workmanship of Indian craftsmen, have, since time immemorial, fascinated the thoughts of people, globally. Every state in India, boasts of an exclusivity and specialty, depending upon its historical influences, traditional skills, and the raw materials, locally presented. India is world famous for its deftness in paintings, exquisite embroidery, and the perfect and beautiful sculptures in stone, metal, wood, temple carvings and gracefully designed jewellery. North India is the home of a large number of tribes and sub-tribes. 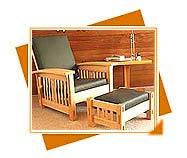 They have an energetic craft tradition and every family excels in craftsmanship. 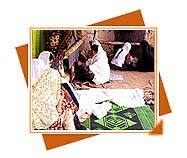 We provide detailed information of arts and crafts to tourists for North India Arts & Crafts Tour. In North India Arts & Crafts Tour, Paintings of Rajasthan- tiny and folk are known all over the world for treatment and composition, color scheme and subjecting. 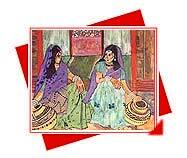 The purpose of Rajasthani paintings is delight. Hence, women have been given importance in all the artists' creations. North Indian craftsmen have always shown an exceptional skill in drawing, chasing and ornamenting of gold and silver articles of everyday and decorative use. 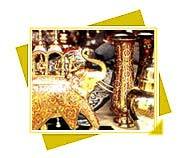 The metalware of Rajasthan comprises artistic cheek work, enameled, engraved and filigree cut work on silver. The Rajasthani carpet and Namdas is but a true expression of the workers' simple philosophy, his responsive perception of nature and its changing moods convincingly translated into the craft. The color combinations are beautiful and worksmanship exquisite. Pottery, one of the old crafts, has its own standing tradition in Rajasthan. Certain shapes are characteristic of Rajasthan. 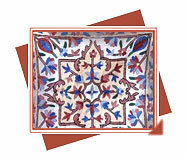 Alwar has been known for its double cutwork pottery known as "kagzi". Haryana was always a rendezvous for various tribes, invaders, races, cultures and faiths, going right back to BC 2500, and it witnessed the merging of numerous styles of painting. 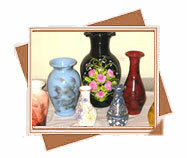 Pottery is essentially a village craft, and Haryana is essentially a village state. Chain stitch, be it in wool, silk or cotton, is done by hook rather than any needle. The hook is referred to as ari, and quality for quality, hook work covers a much larger area than needle work in the same amount of time. 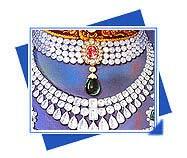 Rig-Veda, the oldest book in the earth, mentions ornaments worn by the gods. Rudra, a Vedic deity, is described as "shining with brilliant gold ornaments" and "wearing" an adorable, uniform necklace". 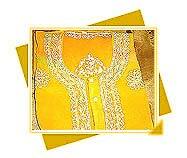 Uttar Pradesh's capital, Lucknow, is closely associated with fine embroidery, chikankari. These cool summery shadow-work saris, kurtas, and veils have been in vogue in this city for hundreds of years.